There could be a number of reasons why you would want to try to create your own sheet music – something that is easy to read and professional looking when printed. You might be a songwriter and want to put your music into written form. Or maybe you’re a student and are attempting to transcribe the solo from a recording by your favorite artist. Whatever the reason, there are quite a few software programs that can help you. The good news if you are on a budget is that there is a wide selection of open source, free and low cost (under $100) programs available. I’m not going to discuss more expensive programs though some may have features you want or need if you are a professional. 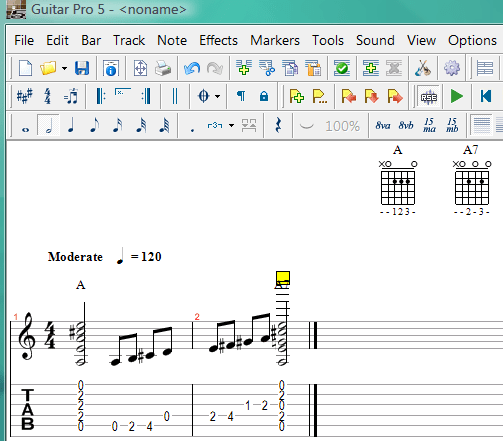 Considering this is a guitar blog, the logical place to start is with software for creating guitar tablature. The original guitar tablature was saved in plain text files. If you are a Windows user then the default editor of “.txt” files is Notepad. You need to display the text in a fixed width font. Courier New is a good choice and may be the only choice depending on your computer. The basics are straight forward. Each guitar string is represented by row of hyphen characters “-” giving six rows for each line of music. Notes are represented by the number of the fret played on that string. Most of you already understand this. But if you are a beginner, here’s a more complete explanation of tablature notation. Notice that there’s no indication of time, key or note durations. This is still very useful for self study or to understand a tune you know but it isn’t going to convey enough information for someone to accurately play your new composition if they have never heard it played. There are many software programs for creating guitar tablature that have features much more advanced than a plain text file editor. I’ve tried many of these over the years. Here’s a list of some of these. The first question you might have is why consider more than one of these programs (ignoring the important point if you are a Mac user that some of these are for Windows only)? The quick answer is you’re right – you can just choose the free, versatile multi-platform program – the obvious choice. 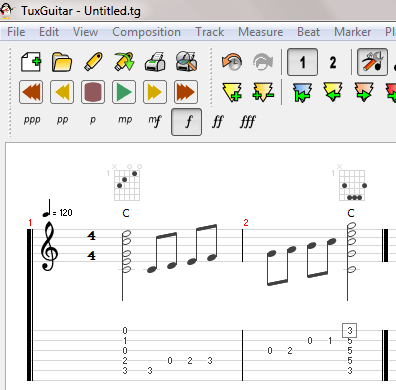 TuxGuitar, a free, open source program that works on Windows, Mac and Linux is in fact my first choice. It will meet most of your needs and is an excellent program. It wasn’t available back when I first wanted tablature programs and I went through the programs then available. The first program I bought was Musedit. I no longer have this on any working computer. I didn’t upgrade when I had the opportunity. I then tried Guitar Pro. I started on Guitar Pro 3 and upgraded to Guitar Pro 5. The software is currently at version 6. I doubt I will upgrade even though it is an excellent program. 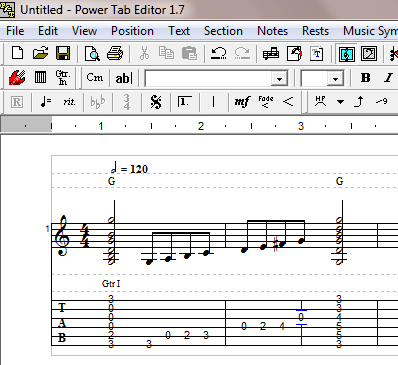 One reason I downloaded PowerTab and bought TablEdit is that I found guitar tabs on the internet in these formats and needed a program that could read them. PowerTab is no longer supported. It is not open source. It has not been updated in years. But because it was free, many commercial companies released free “teaser” guitar lessons in the PowerTab format so that anyone could see them. However, compared to software that is still being supported and updated, PowerTab is just hanging on. One of the ways these programs differ is in which file formats are supported. Although in the following table I have combined import with read and export with write they are not the same. Read means the software can directly open the file while import implies the file must be converted (often through the use of a plugin). You probably don’t care but if you have one of these programs and can’t open a file you thought was supported, check for “Import…” on the file menu. Differences in which file formats can be read or imported is more complicated that shown in the table. Some of the programs do better at reading/importing files than others. I recently experimented with exporting a score in ABC or midi from one program and importing it into another. In general TablEdit did a better job than the other programs I tried in accurately recreating the score I had started with. Beyond differences in reading, writing and conversion abilities, the programs differ in how things look on the screen, how nice the printouts look and how easy it is to do different functions. All of the programs create a score in standard music notation from the tab you entered. You can also create tabs for other stringed instruments, e.g., bass, banjo, mandolin, or ukulele. Some include the option to create music in non-standard tablature for instruments such as harmonica or hammered dulcimer. 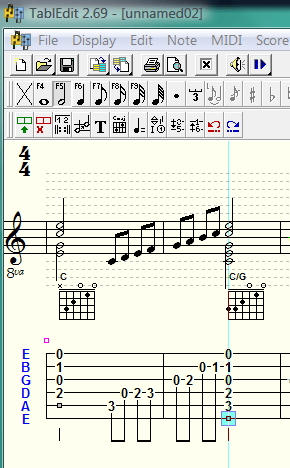 A nice feature I discovered in TuxGuitar was the ability to edit the musical notation directly. This is nice if you have a printed copy of a tune and want to convert it to tab. The notes may not end up on the frets you wish, but it is a good starting point. However, I found editing the musical score to be difficult because I could not magnify the size of the staff in order to clearly see where I was clicking my mouse. Another annoyance I find with most of these programs is that they are too smart. The programs attempt to automatically adjust the length of notes and rests in each measure so the beats always match the time signature. This becomes annoying when you insert, delete or change a note and suddenly find changes to the following notes and rests which had been correct. Finally, there is a learning curve with each of these programs. My biggest problem in entering notes is that I forget to change the duration. Thus if am entering eighth notes I might forget to change to quarter or sixteenth notes when needed. By the time I notice the error, the too smart program has changed other notes and filled the measure with rests which makes it difficult to find where my errors started. In spite of these problems, these are useful programs. But they are not the only way to create musical scores in tablature or standard notation. I will discuss some other notation systems and software you should know about in an upcoming posts. Next post “The ABC’s of Musical Notation“. I appreciate your notification of a problem. I looked into it but could not replicate the error. All 3 articles in the series displayed properly for me. I can only guess that 1) there was a temporary server problem OR 2) there was a temporary network problem or 3) there is something specific about the setup of your browser or computer that caused the error message you saw. I can’t do anything about any of those 3 situations. But thank you for the message. I do care about the performance of this site and want to fix anything that’s broken.